We’ve been warned: The Enemy is on the prowl; his demon forces are looking for breaches in our walls, so that they may enter into our midst and wreak havoc. 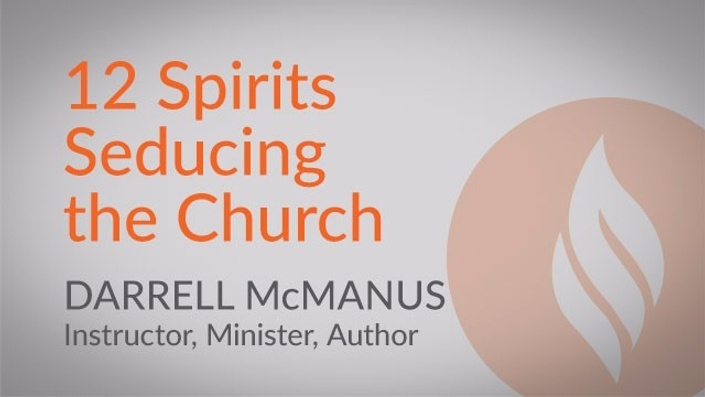 In 12 Spirits Seducing the Church, Darrell McManus unmasks the destructive demons operating in our churches and in our homes today. He has seen these destructive forces at work in both the family unit and in the corporate church setting – and he wants you to be aware of them too. Do you know a chronic nitpicker? Have you met anyone who is hyper-critical of spiritual leaders? Have you ever been in the company of someone who consistently talks about the obstacles they are facing, rather than focusing on the promises of God? Do you know someone who complains and makes others feel bad in order to get his/her own way? If you answered yes to any of these questions, then you, too, may have come in contact with one or more of these seducing spirits. If you want to know for sure – and protect yourself, your home, and your church from these destructive demons – this course is a must! It could radically change your life! With a ministry spanning over forty years Darrell is a prolific bible teacher with a powerful healing anointing. He has seen many saved, filled with the Holy Spirit, delivered, along with creative miracles and the dead being raised. He has a rich ministry heritage, whose deep roots of revival date back four generations to the turn of the nineteenth century in the United States of America. His early ancestors moved in mighty miracles of healing, and were early pioneers of the move of God in this nation. Darrell grew up in revival, seeing teeth filled miraculously, and supernatural weight loss, along with many other miracles, salvations and Holy Spirit infillings. As a result, He began to shut himself in with the Lord at an early age. Serving in many aspects of ministry Darrell was led into obscurity and hid out with the Lord for fourteen years much like the Apostle Paul. One of the things the Lord asked him to do was to listen to the word of God through an mp3 player many hours a day and throughout the night for a number of years. In a time of intense prayer and fasting God appeared to him and imparted revelation about His Throne. Before writing his latest book, “What You Didn’t Know About God’s Throne” the Holy Spirit led Darrell into an intense time of prayer and fasting; he began praying in the Spirit at least six hours a day, but on average eight or more hours a day. This extended period of praying in the Spirit caused mighty revivals to begin to break out. Darrell is founder of Darrell McManus Ministries in the United States and for the last eight years has overseen 684 churches and built and established a large orphanage in India. He has also ministered in South Africa, Honduras, and China, and recently The Lord has given him oversight of a ministry and orphanage in the Philippines. He’s had the joy of being a pastor for more than twenty six years. Darrell is now traveling full time and is in demand as a conference speaker and has appeared on numerous television and radio programs. He conducts School of Ministry classes in various venues, where many are trained to flow in God’s supernatural power. Darrell’s passion is to see believers discover and operate in their God given assignments. God gave Darrell a mandate to help bring an Awakening to this nation and the world. He and his wife Cindy live in Gause, TX. They have two sons, two daughters, five grandsons and one granddaughter.